"Patagonia Expedition" is a travel consultant company founded in 1993 at Santiago de Chile, with the deep experience of the adventure tourism in Andes. The director, Kenji Hiraoka (right photo) is a Japanese who lived in Chile, an experienced outdoor guide in Andes - especially Patagonia area. 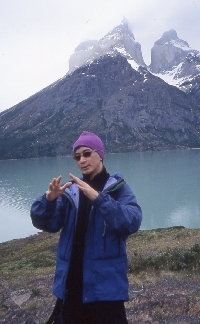 He is only Japanese who has official licence of trekking guide in Chile. For more than 20 years we have operated the various active tours throughout the South America, mainly for the groups from Asian countries, and through this long experience in Andes, we have created the firm network with the reliable local operators and very skilled outdoor guides. With this network, we'll offer you the high quality outdoor tours with maximum care for your safety. We guaranty your safety at the remote area, on the trek route in the Andes, or even at the summit of 6000m peaks. If you are interested in the adventure travel in South America, please feel free to contact us. English, Spanish, and Japanese spoken.